OK to Wake! 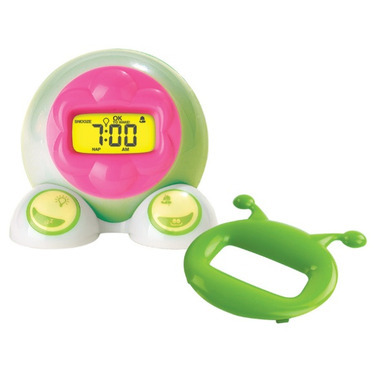 is a flexible bedside alarm clock, nap timer, and dual-colour night-light. 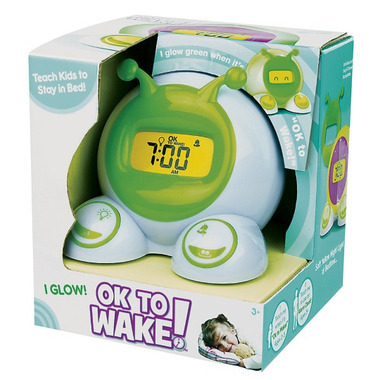 Two fun faceplates and wacky animations give OK to Wake! a personality all its own. Fully battery operated with features designed to grow with your child. NOTE: Requires 4 AA batteries (not included). Suitable for ages 3 years and up. My kids finally stay in their room until the time we set. No more arguing with the independent kids. My almost 4 year was waking too early and starting his day. I chose this clock b/c it's not "too baby" (as per the 4 year old) and the price point. Set up is easy, kid approved, and, most importantly, it works (he stays in bed and is quiet until it lights up green, from the first time we tried it). We adjusted the ok to wake times incrementally and slowly. This clock is very easy to use. My 4 year old is no longer getting dressed at 3 am and waking us up thinking it's morning time. She also likes the night light feature. Was shipped very quickly. This clock has been a morning game changer! My 3 year old had suddenly started getting up at all hours and wanting to go downstairs to play. Now he knows that he has to wait for his clock to glow green, and then we get up. He gets so excited and can't wait to show us that it's glowing so we wake up with a smile. I also love that it's battery operated so I don't have to worry about cords. There is a cord if you prefer or if your kid is older. I would absolutely recommend this to everyone with a small child that is learning about schedules and appropriate timing. We've been using this clock for at least half a year now and our three year old still pays attention to it in the morning - she stays in bed until it's green (whereupon we hear "Daddy. Daddy. The light is green. Daddy." etc. It's a house alarm clock). It's also durable enough to stand up to our one year old rolling it around a bunch. I bought this for my 3 years old daugther and she stays in bed now until the light turns on. she feels like a big girl now and it is easy to use it. I was at first a little weary about purchasing this as it was quite a bit of money for a kids clock, but it was well worth the money! My daughter Eberlee was waking up between 5-6am every morning. We set the timer for 7am and switched the (green) light to stay on for an hour and a half and explained to her that the light would change when it was time to wake up in the morning. Every morning now she stays in her room until the light turns green and then comes out so excited and wanting to show us. Very user friendly. Definitely worth the money!